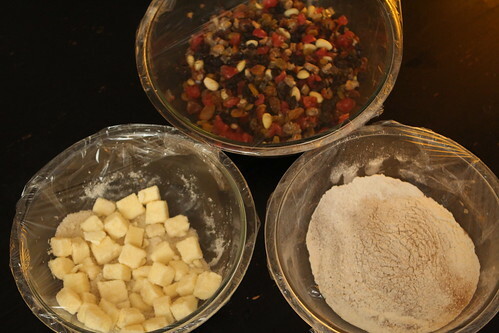 There lives, in Jen's family recipe archive, a recipe for fruit cake which comes from someone named Mrs. Willis which was apparently printed in the Toronto Star decades ago. The recipe seems to be made for institutional use as it yields 11 1/2 pounds of cake. I can't imagine this being practical for home use in any way. Instead Jen usually makes half the recipe which lasts us four years in the freezer. It's unfortunate because she made a four-year batch last year but unfortunately we had to throw it away after our Hurricane Sandy week-long power outage. 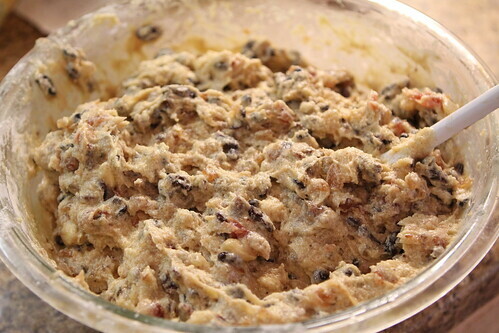 I didn't like the idea of eating fruitcake which sat in a freezer for a week with rotting shrimp. I know. I'm very particular. That batch was the first batch since Jen's 2008 batch. So it was that we needed to make fruit cake for the second year in a row. 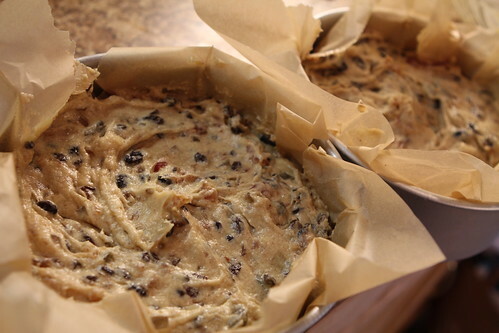 Time has been at a premium so it became apparent that If we were going to have the fruit cake ready for Christmas with proper brandy-soaking time we were going to need to get a move on. That meant, unfortunately, that I had to make it. This was unfortunate because I'm not generally a great fan of baking. Actually, that's not true. I don't mind baking, I just hate measuring things. I painstakingly measured out all the assorted fruits and soaked them in brandy overnight. I made the weird jam-and-pineapple sauce, portioned out the dry ingredients, creamed the sugar and butter and sugar, and got the cakes into the oven. It was only about forty minutes later that it occured to me that I had not measured out the butter properly. I was making a half batch but, in my rush to get the cakes made, I accidentally put in the full amount of butter, that's twice as much as needed. The cakes baked up pretty well. They even tasted pretty good but a bit on the buttery side as you would properly imagine. Who knows how they would hold up in the freezer after four years? Chances could not be taken. I would have to bake again. After that charade I made myself a sandwich out of the remaining roast pork loin from the other night with some toasted bread and Sierra Nevada Pale Ale & Honey Spice Mustard. The sandwich was delicious but I wasn't able to enjoy it as I contemplated the sorrow of what had just happened. So, after all that, I needed to run out to the grocery store, pick up a few extra ingredients, and put together all the mise en place to be able to try this again tomorrow night. Of course Jen will be out of town and I will be watching the Wombats by myself. What could possibly go wrong with this plan? For dinner, because of the fruit cake mishap, I made the most boring dinner ever. It was so boring that I hesitated to take a picture of it or even to discuss it. 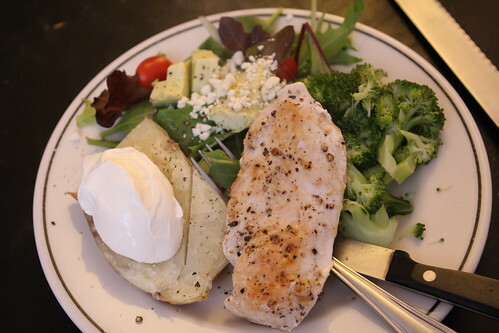 I made pan-seared chicken breast, steamed broccoli, and a baked potato. It's a shame that I foolishly did not photograph the Shepherd's pie last night while this plate of boredom gets to be represented on this blog. 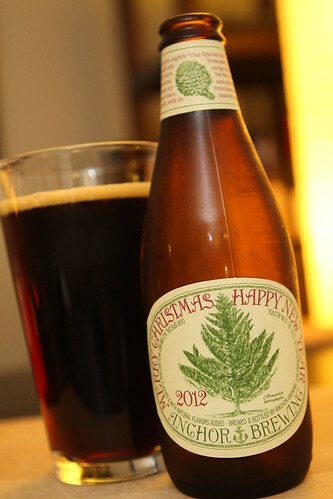 2012 Christmas Ale from Anchor Brewing. I had this for the first time last year but each yar is a unique recipe so I figured it would be a nice way to send Jen off on her business trip. Until her return I will bumble through taking care of the Wombats by myself in hopes that when Jen returns they will not be too smelly or malnourished.